Stroke is a common cause of morbidity and mortality in the developed world and largely thought of as a disease of the elderly. However, recently, epidemiologic studies have demonstrated that the entity is not uncommon among adolescents and young adults., Current estimates indicate that of all the stroke patients, 10%–15% strokes occur in young adults. Clearly, it deserves to be considered as a part of the differential diagnoses in patients presenting with acute neurological symptoms even in the young. Stroke in the young is the third most common cause of death worldwide and the fourth leading cause of disease burden. This can be devastating both for the affected individual and the immediate family, and the social order due to production of individual disability and loss of productivity. Even though diverse studies have used a varying cut-off for qualifying “young stroke,” the large consensus seems to favor 49 years as the upper limit of age for the segregation of young stroke. Current epidemiological data suggest that stroke in the young may well be an independent entity, with diverse risk factors and etiologies. There is diversity in the incidence, etiology, and prognosis of stroke in young patients especially in developing countries. Studies of Indian immigrants to industrialized countries show that Indians are more susceptible compared with Caucasians to coronary artery disease and stroke. In a study of more than 1008 young patients (15–49 years) in Finland, stroke was more common with increasing age even in the young adult age group. A yearly incidence of stroke of 2.4 per 100,000 in the age group of 20–24 years and 32.9 per 100,000 in the age group of 45–49 years was observed in this study. The frequency of stroke was more in women 20–30 years of age and in men older than 35 years. Strokes in the young have been attributed to factors such as race and ethnicity. Young blacks have significantly greater stroke incidences than young whites according to the Northern Manhattan Study. Etiology of stroke has been described under the broad groups of ischemic, hemorrhagic, and venous categories., Ischemic causes include cardioembolic, vasculitis, genetic, and inherited diseases. It was observed that central venous thrombosis and rheumatic heart diseases are the leading causes of young stroke. In India, tubercular meningitis and bacterial meningitis still remain an important cause of stroke. In a retrospective study conducted on 127 young adults with stroke, stroke etiology was found to be cardioembolic in 29.3%, large artery atherosclerosis in 22%, inherited haematological conditions in 1.8% of patients, nonatherosclerotic vascular disease was found to be causative in 15.6%, and other miscellaneous causes were observed in 22% of patients. In almost 10% of the remaining cases, etiology was cryptogenic. Among cardiac causes, rheumatic heart disease was identified as the most common etiology of stroke in the young. Even though the modifiable risk factors are shared, there is a significant difference in the risk factors for stroke in young adults and older individuals [Table 1]. In a study describing the risk factors with demographic characteristics according to the gender and TOAST classification, transient ischemic attack and family history of stroke were important risk factors found in 26% and 15.7% of patients, respectively, besides hypertension (44.5%), dyslipidemia (26.1%), and diabetes (13.9%). Hypertension, hyperglycemia, and tobacco use with low hemoglobin levels were the important risk factors in a study from north India. In Athens young stroke registry, a study conducted on 253 consecutive first-ever ischemic stroke young patients (<45 years) showed smoking (59%) and dyslipidemia (41%) as the leading vascular risk factors. Another multicenter study evaluated differences in vascular risk factors in 3944 patients with first-ever ischemic stroke at age 15–49 years from 15 cities in 12 European countries from hospital registries or population-based studies on young adults. Migraine is another important risk factor for stroke in the young. A significantly higher risk of stroke was seen in migraine with aura. Migraine with aura along with other risk factors such as age less than 45 years, smoking, and concurrent oral contraceptive use have compounding effect on the risk of stroke compared with people who had migraine without aura. Similar results were seen in a subgroup from the Women's Health Study after adjustment for major vascular risk factors. Increased incidence of stroke has been observed during pregnancy and puerperium with reasons undefined. Different theories and studies explain that hypercoagulable state which causes changes in vessel wall function is typically observed in pregnancy. In pregnancy, it is more often seen in patients with eclampsia, a typical pregnancy-related disease, and the pathophysiology has been linked with nonhemorrhagic stroke-like episodes and cerebral vasoconstriction syndrome. Oral contraceptive use as a risk factor for stroke in young is still controversial and not clearly known. The risk for stroke increased fourfold for women who take pills with a high content of estrogen and doubled for those who take pills with low estrogen content. Whereas no increase in the risk of stroke among women using only progestogen contraceptives was seen in a meta-analysis conducted on six case–control studies. In contrast, increased risk of ischemic stroke was observed in another meta-analysis with use of oral contraceptives. There appears to be a dose-dependent increase in risks and smaller estrogen dosage was associated with lower risk. Unfortunately, the most common complication of drug abuse in the young population is stroke. It accounts for almost 12% of cases of stroke in young. Therefore, in young patients presenting with stroke, unless a precise diagnosis is made, screening for illicit drugs must be done. Vasoconstriction, platelet aggregation, cardiac arrhythmias, and embolism, which further lead to stroke, are seen after intravenous use of drugs such as cocaine or amphetamines. Specific diseases such as spontaneous arterial dissection though rare but common cause of stroke in young adults have been observed. Extracranial internal carotid artery is commonly involved in cervical dissection, which starts a few centimeters after common carotid bifurcation or vertebral artery. Arterial stenosis or occlusion is often seen consequent to subintimal dissections. Rupture of these vessels results in hematoma. The predisposing factors are mostly head and neck trauma. There is a concomitance between vascular risk factors, such as hypertension, and genetic factors. Fibromuscular dysplasia (FMD) of carotid and vertebral arteries is another potential cause of stroke in young adults. FMD is a noninflammatory, nonatherosclerotic vascular disease which mainly affects the renal and carotid artery resulting in arterial stenosis, occlusion, aneurysm, and dissection., Most of the patients with FMD are at higher risk of stroke seen in approximately 15% of patients especially with spontaneous dissection of the carotid or vertebral artery. Although a variety of genetic, hormonal, and mechanical factors have been implicated in the pathophysiology of FMD, it is still poorly understood. International registries of FMD are currently investigating the natural history, diagnosis, treatment, and potential role of genetics in FMD. Fugate J et al. have shown association of hepatitis C virus infection with stroke. Infectious endocarditis frequently leads to embolic stroke. VZV produces vasculopathy by direct invasion of cerebral arteries. Nearly all central nervous system fungal infections have the tendency to occlude small blood vessels in meningitis and may also cause mycotic aneurysms. These further lead to inflammatory changes in cerebral vessels conspicuously in the distribution of small leptomeningeal vessels. Fungal infections with Exserohilum species which lead to ischemic stroke have been reported by spinal injections of contaminated methylprednisolone. Hematological diseases such as paroxysmal nocturnal hemoglobinuria, thrombotic thrombocytopenic purpura, erythrocytosis, leukemias, and intravascular lymphoma have been associated with risk of stroke in the young. These all increase the risk of thrombosis or hemorrhage. Among these hematological diseases, the strongest association has been observed for sickle cell disease (SCD)., It leads to formation of thrombus in the cerebral vasculature, with intimal proliferation of the vessels, discontinuity of the internal elastic lamina, and proliferation of endothelial cells. Coagulation disorders predispose to venous strokes more than arterial strokes. Platelet function abnormality, inherited hemostatic abnormality, and vascular injury also promote thrombosis. Congenital cardiac anomalies also constitute significant percentage of stroke in young. Patent foramen ovale (PFO) is found in 15%–25% of the general population. It is a common remnant of the fetal anatomy. PFO combined with atrial septal aneurysms (ASA) has been identified as an important etiology of stroke in young. ASA is an additional abnormality of the interatrial septum, which usually occurs in association with PFO. When present, it tends to occur in association with larger shunts and has been demonstrated to be associated with increased risk of recurrent stroke. A study conducted in young patients with ischemic stroke and a normal cardiac examination demonstrated significantly greater prevalence of PFO in patients with stroke (40%) than in the control group (10%, P < 0.001). However, this association was weaker or absent in older patients, and the real impact of PFO in stroke is still controversial. The same trend was observed in all age, gender, and race-ethnic subgroups. Atrial fibrillation (AF), though one of the major causes of cardioembolic stroke in elderly, is less associated with stroke in young. A prevalence of AF is less than 0.1% among young adults. Similarly, low prevalence in young adults is seen in other abnormalities such as cardiomyopathy, valvular disease, and endocarditis. The etiological diagnosis of stroke in young adults needs a different and more complex diagnostic work-up than in elderly. Real impact of genetics is still unknown. Stroke is a heterogeneous multifactorial disorder. Studies have been conducted in twins, families, and animal models which provide evidence for a genetic contribution to stroke. Ischemic stroke is caused by a combination of multiple genetic and environmental factors. No good preclinical biomarkers are still available for studying the molecular and physiological processes which lead to a stroke event. Genetic relatedness and stroke association vary from 30% to 76% as shown by various studies [Table 2]. Heritability of 32% for stroke death and 17% for stroke hospitalization was seen in a study conducted by Bak S et al. Evidence for a genetic contribution was summarized by Flossmann et al. across 9 cohort studies, 27 case–control studies, and 3 twin studies. A positive family history of stroke was associated with an ≈30%–76% increase in stroke risk. In the Framingham Study, a parental history was associated with a 2.22-fold increase in risk in offspring (P < 0.05). Childhood stroke is more common with these single-gene disorders. More than 50 single-gene disorders are implicated with stroke in young. However, overall, these account for less than 1% of stroke cases in young adults. Identification of genetic causes becomes important for appropriate counseling and management. Genetic diseases have been classified as monogenic and polygenic disease. Terni et al. in a review article have extensively enumerated the genetic relatedness to stroke. The monogenic diseases include mitochondrial diseases, familial hemiplegic migraine, cerebral autosomal dominant arteriopathy with subcortical infarcts and leukoencephalopathy (CADASIL), cerebral autosomal recessive arteriopathy with subcortical infarcts and leukoencephalopathy (CARASIL), Fabry's disease, other rare autosomal dominant small-vessel disease, homocystinuria, stroke, and vasculopathy associated with ADA2 mutation, sickle cell disease (SCD), and disorders of the connective tissue associated with stroke. Polygenic conditions include homocysteine metabolism defect, renin–angiotensin–aldosterone system, hemostasis, platelet glycoproteins, lipid metabolism, and matrix metalloproteinases.,,, Individuals and families causing mendelian or mitochondrial disease have to be recognized. Mendelian diseases are recognized by their familial history, young age of onset, more severe clinical course, and higher recurrence rate when compared with sporadic disease. Mitochondrial-related strokes may be maternally inherited and are more life-threatening. Monogenic diseases account for less than 5% of all cases. Due to diagnostic constraints, these are still underreported. Mitochondrial encephalopathy with lactic acidosis and stroke-like episodes (MELAS) is one of the most common maternally inherited mitochondrial diseases. CADASIL is one of the most common and most widely studied among the monogenic diseases as the hereditary cerebral small-vessel disease. CADASIL is caused by dominant mutations in the NOTCH3 gene. The estimated prevalence of CADASIL in young patients with stroke is very low. It is also associated with modifiable vascular risk factors. The percentage of young developing stroke with CARASIL is also low. CARASIL is linked to a mutations in the HtrAserine peptidase 1 (HTRA1) gene. It is well documented that low consumption of fruits and vegetables, sedentary lifestyles, and psychological stress are among the additional contributory factors for stroke in young. Sedentary lifestyle, drug abuse, oral contraceptives, and the ratio of apolipoprotein B to apolipoprotein A1 are more recent subjects of investigation. Increased ratio of apolipoprotein a1 has been shown to be associated with carotid atheroma. Obesity, psychological stress, raised apoB/apoA 1 ratio, physical inactivity, and low fruit and vegetable intake are also associated with increased stroke. In addition, newer risk factors, including homocysteine and chronic infection (Chlamydia pneumoniae and periodontal disease), are being studied as predictors of ischemic stroke. Controlling of hypertension and biochemical risk factors and avoiding smoking become the foremost factors to reduce the risk of stroke. Acute management, prognosis, and long-term strategies to prevent recurrence vary considerably depending on the etiology and type of stroke. The diagnosis of many of the subtypes, such as cardioembolic stroke, atherothrombotic stroke, antiphospholipid antibody syndrome (APLA syndrome), and coagulopathies, requires detailed clinical, radiological, and laboratory evaluation. Management of a young adult with an acute stroke is the main clinical challenge. Advancement in the diagnostic modalities has significantly improved in the past few decades. Cerebral vessels are better visualized with high-resolution magnetic resonance imaging machines. Cardiac anatomical structures and cardiac functions are analyzed in a better way. Community-based studies have not been of immense help to predict the outcome and prognosis of stroke in young adults because of slightly low incidence. The severity of stroke and cardiac failure have been the main predictors of mortality as shown in the Athens Young Stroke Registry. The 10-year survival probability in young with stroke was 86.3% and of composite vascular events was 30.4%. Most of the patients were functionally independent at the end of the follow-up period. The Safe Implementation of Thrombolysis in Stroke-International Stroke Thrombolysis Register (SITS-ISTR) was a clinical trial aimed to assess the safety and efficacy of thrombolysis in 18- to 50-year-old patients with stroke compared with those age 51–80 years. The main outcome measures were symptomatic intracerebral hemorrhage, mortality, and functional independence (modified Rankin Scale) at 3 months. The results suggest that thrombolysis is safe in young compared with older stroke patients and needs to be taken into consideration in treatment of this subpopulation of ischemic stroke patients. Prevention is the primary treatment strategy which will reduce the morbidity and mortality related to stroke. The American Heart Association and guidelines of the European Stroke Organisation cover the stroke prevention in detail, which are common for both young and elderly groups. No separate guidelines for stroke prevention in young are available. Public awareness regarding the warning symptoms of stroke among public needs to be strengthened. Stepping up of awareness drive is urgently required as there is poor recognition of early stroke symptoms, which leads to delay in hospitalization and early embolic therapy. This group becomes important as stroke in the young has major long-term socioeconomic consequences. Our focus should be on primary and secondary stroke prevention and lifestyle modification like quitting smoking, reducing alcohol consumption, maintaining the body mass index, regular physical exercises, and adopting for a diet rich in fruits and vegetables. Stroke in young adults is a major public health problem. The factors responsible for stroke in young adults are quite different from those that cause stroke in elderly. Classical vascular risk factors, arteriopathy, cardiac diseases, monogenic disorders, and multifactorial genetic contributions represent the potential causes of stroke in young. Hence, a different approach is required to investigate and manage these patients. Although atherosclerosis still contributes to a large proportion of stroke in both young and elderly, there is a need for aggressive risk management. In young, looking for PFO and atrial septal defect (ASD) should be essential in the investigation. Recognition of the underlined genetic disorders causing stroke is important for the correct management of the patient. Advances in the imaging technologies and genetic testing may increase the identification of the causes and mechanisms of stroke in young adults. The recent methods such as gene profiling, proteomics, genomics, and whole genome sequencing technologies which detect the functional changes induced by genetic variations and nongenetic factor may additionally help in addressing the causes of stroke in the young. Moreover, further multicentric population-based studies and randomized clinical trials in stroke in young patients may help develop effective guidelines for treatment and prevention of stroke in this important subpopulation. Looking toward the increasing incidence of stroke in the young, clearly there is an imperative need for further research to decrease the disease burden. Fratiglioni L, Wayne ME, Schoenberg DG. Mortality from cerebrovascular disease. International comparisons and temporal trends. Neuroepidemiology 1983;2:101-6. Adams HP Jr, Kappelle LJ, Biller J, Gordon DL, Love BB, Gomez F, et al. Ischemic stroke in young adults. Experience in 329 patients enrolled in the Iowa Registry of stroke in young adults. Arch Neurol 1995;52:491-5. Dzevdet S. Strokes in young adults: Epidemiology and prevention. Vasc Health Risk Manage 2015;11:157-64. Mehndiratta MM, Agarwal P, Sen K, Sharma B. Stroke in young adults: A study from a university hospital in north India. Med Sci Monit 2004;10:CR535-41. Kittner SJ, Stern BJ, Wozniak M, Buchholz DW, Earley CJ, Feeser BR, et al. Cerebral infarction in young adults: The Baltimore-Washington Cooperative Young Stroke Study. Neurology 1998;50:890-4. Srinivasan K. Ischemic cerebrovascular disease in the young. Two common causes in India. Stroke, 1984;15:733-5. Putaala J, Metso AJ, Metso TM, Konkola N, Krae-Mer Y, Haapaniemi E, et al. Analysis of 1008 consecutive patients aged 15 to 49 with first-ever ischemic stroke: The Helsinki Young Stroke Registry. Stroke 2009;40:1195-203. Nayak SD, Nair M, Radhakrishnan K, Sarma PS. Ischaemic stroke in the young adult: Clinical features, risk factors and outcome. Natl Med J India 1997;10:107-12. Dash D, Bhashin A, Pandit AK, Tripathi M, Bhatia R, Prasad K, et al. Risk factors and etiologies of ischemic strokes in young patients: A tertiary hospital study in North India. S2014;16:173-7. Baloch GH, Shaikh S, Jaffery MH, Almani SA, Memon NM, Qasim M. Stroke localization – Clinical correlation versus finding of CT scan brain in patients admitted at Liaquat University hospital Hyderabad/Jamshoro. J Liaquat Uni Med Health Sci 2009;8:3-6. Griffiths D, Sturm j. Epidemiology and etiology of young stroke. Stroke Res Treat 2011;2011:1-6. Katsnelson MJ, Della-Morte D, Rundex TJ. Stroke in young. Period Biol 2012;114:347-53. Nabavi D G, Allroggen A, Ringelstein E B. Juvenile ischemic brain infarction. Clinical aspects, etiology spectrum, diagnosis and therapy. Nervenarzt 2004;75:167-86. Love BB, Biller J, Jones M P, Adams H P Jr., Bruno A. Cigarette smoking. A risk factor for cerebral infarction in young adults. Arch Neurol 1990;47:693-8. Bhat VM, Cole JW, Sorkin JD, Wozniak MA, Malarcher AM, Giles WH, et al. Dose-response relationship between cigarette smoking and risk of ischemic stroke in young women. Stroke 2008;39:2439-43. Dash D, Bhashin A, Pandit AK, Tripathi M, Bhatia R, Prasad K, et al. Risk factors and etiologies of ischemic strokes in young patients: A tertiary hospital study in North India. J Stroke 2014;16:173-7. Kulshrestha M, Vidyanand. An analysis of the risk factors and the outcomes of cerebrovascular diseases in Northern India. J Clin Diagn Res 2013;7:127-31. Spengos K, Vemmos K. Risk factors, etiology, and out-come of first-ever ischemic stroke in young adults aged 15 to 45 – The Athens young stroke registry. Eur J Neurol 2010;17:1358-64. Putaala J, Yesilot N, Waje-Andreassen U, Pitka-Niemi J, Vassilopoulou S, Nardi K, et al. Demographic and geographic vascular risk factor differences in European young adults with ischemic stroke: The 15 cities young stroke study. Stroke 2012;43:2624-30. Schurks M, Rist PM, Bigal ME, Buring JE, Lipton RB, Kurth T. Migraine and cardiovascular disease: Systematic review and meta-analysis. BMJ 2009;339:b3914. Kurth T, Gaziano JM, Cook NR, Logroscino G, Diener HC, Buring JE. Migraine and risk of cardiovascular disease in women. JAMA 2006;296:283-91. Sharshar T, Lamy C, Mas J L. Incidence and causes of strokes associated with pregnancy and puerperium. A study in public hospitals of Ile de France. Stroke in Pregnancy Study Group. Stroke 1995;26:930-6. Davie CA, O'Brien P. Stroke and pregnancy. J Neurol Neurosurg Psychiatry 2008;79:240-5. Chakhtoura Z, Canonico M, Gompel A, Thalabard JC, Scarabin PY, Plu-Bureau. Progestogen-only contraceptives and the risk of stroke: A meta-analysis. Stroke 2009;40:1059-62. Gillum LA, Mamidipudi SK, Johnston SC. Ischemic stroke risk with oral contraceptives: A meta-analysis. JAMA 2000;284:72-8. Sloan MA, Kittner SJ, Feeser BR, Gardner J, Epstein A, Woznaik MA, et al. Illicit drug-associated ischemic stroke in the Baltimore-Washington Young Stroke Study. Neurology 1998;50:1688-93. Westover AN, Mcbride S, Haley RW. Stroke in young adults who abuse amphetamines or cocaine: A population-based study of hospitalized patients. Arch Gen Psychiatry 2007;64:495-502. Debette S, Leys D. Cervical-artery dissections: Predisposing factors, diagnosis, and outcome. Lancet Neurol 2009;8:668-78. Arnold M, Pannier B, Chabriat H, Nedeltchev K, Stapf C, Buffon F, et al. Vascular risk factors and morphometric data in cervical artery dissection: A case-control study. J Neurol Neurosurg Psychiatry 2009;80:232-4. Nebelsieck J, Sengelhoff C, Nassenstein I, Maintz D, Kuhlenbaumer G, Nabavi DG, et al. Sensitivity of neurovascular ultrasound for the detection of spontaneous cervical artery dissection. J Clin Neurosci 2009;16:79-82. Nedeltchev K, Bickel S, Arnold M, Sarikaya H, Georgiadis D, Sturzenegger M, et al. R2-recanalization of spontaneous carotid artery dissection. Stroke 2009;40:499-504. Slovut DP, Olin JW. Fibromuscular dysplasia. Curr Treat Options Cardiovasc Med 2005;7:159-69. Salvarani C, Brown RD Jr., Calamia KT, Christianson T, Weigand SD, Miller DV, et al. Primary central nervous system vasculitis: Analysis of 101 patients. Ann Neurol 2007;62:442-51. Urbanus RT, Siegerink B, Roest M, Rosendaal FR, de Groot PG, Algra A. Antiphospholipid antibodies and risk of myocardial infarction and ischaemic stroke in young women in the RATIO study: A case-control study. Lancet Neurol 2009;8:998-1005. Futrell N, Millikan C. Frequency, etiology, and prevention of stroke in patients with systemic lupus erythematosus. Stroke 1989;20:583-91. Vaitkus A, Krasauskaite E, Urbonaviciute I. Meningovascular neurosyphilis: A report of stroke in a young adult. Medicina (Kaunas) 2010;46:282-5. Kalita J, Misra UK, Nair PP. Predictors of stroke and its significance in the outcome of tuberculous meningitis. J Stroke Cerebrovasc Dis 2009;18:251-8. Ries S, Schminke U, Fassbender K, Daffertshofer M, Steinke W, Hennerici M. Cerebrovascular involvement in the acute phase of bacterial meningitis. J Neurol 1997;244:51-5. Dobbs MR, Berger JR. Stroke in HIV infection and AIDS. Expert Rev Cardiovasc Ther 2009;7:1263-71. Cantu C, Villarreal J, Soto J L, Barinagarrementeria F. Cerebral cysticercotic arteritis: Detection and follow-up by transcranial Doppler. Cerebrovasc Dis 1998;8:2-7. Carod-Artal FJ. Stroke: A neglected complication of American trypanosomiasis (Chagas' disease). Trans R Soc Trop Med Hyg 2007;101:1075-80. Fugate JE, Lyons JL, Thakur KT, Smith BR, Hedley-Whyte ET, Mateen FJ. 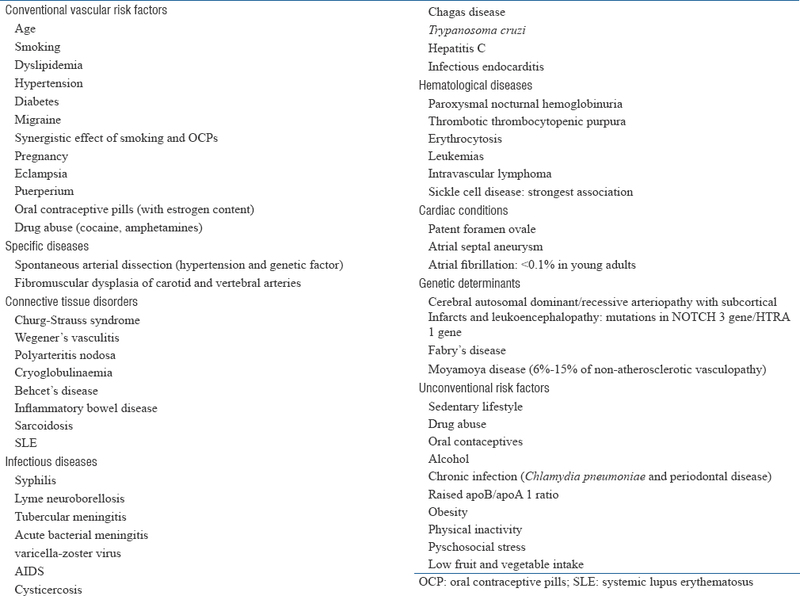 Infectious causes of stroke. Lancet Infect Dis 2014;14;9:869-80. Nagel MA, Mahalingam R, Cohrs RJ, Gilden D. Virus vasculopathy and stroke: An under-recognized cause and treatment target. Infect Disord Drug Targets 2010;10:105-11. Ritter JM, Muehlenbachs A, Blau DM, Paddock CD, Shieh WJ, Drew CP, et al. Exserohilum infections associated with contaminated steroid injections. A clinicopathological review of 40 cases. Am J Pathol 2013;183:881-92. Adams RJ. Stroke prevention and treatment in sickle cell disease. Arch Neurol 2001;58:565-8. Rothman SM, Fulling KH, Nelson JS. Sickle cell anemia and central nervous system infarction: A neuropathological study. Ann Neurol 1986;20:684-90. Cotter PE, Belham M, Martin PJ. Stroke in younger patients: The heart of the matter. J Neurol 2010;257:1777-87. Lechat P, Mas J L, Lascault G, Loron P, Theard M, Klimczac M, et al. Prevalence of patent foramen ovale in patients with stroke. N Engl J Med 1988;318:1148-52. Handke M, Harloff A, Olschewski M, Hetzel A, Geibel A. Patent foramen ovale and cryptogenic stroke in older patients. N Engl J Med 2007;357:2262-8. Di Tullio MR, Sacco RL, Sciacca RR, Jin Z, Homma S. Patent foramen ovale and the risk of ischemic stroke in a multiethnic population. J Am Coll Cardiol 2007;49:797-802. Di Tullio MR. Patent foramen ovale: Echocardiographic detection and clinical relevance in stroke. J Am Soc Echocardiogr 2010;23:144-55. Della-Morte D, Guadagni F, Palmirotta R, Testa G, Caso V, Paciaroni M, et al. Genetics of ischemic stroke, stroke-related risk factors, stroke precursors and treatments. Pharmacogenomics 2012;13:595-613. Bak S, Gaist D, Sindrup SH, Skytthe A, Christensen K. Genetic liability in stroke: A long-term follow-up study of Danish twins. Stroke 2002;33:769-74. Flossmann E, Schulz UG, Rothwell PM. Systematic review of methods and results of studies of the genetic epidemiology of ischemic stroke. Stroke 2004;35:212-27. Chang YC, et al. Genetics of ischemic stroke in young adults. Circ Cardiovascular Genet 2014;7:383-92. Terni E, Cole JW, Kittner SJ, Mitchell BD. Genetics of ischemic stroke in young adults. Circ Cardiovasc Genet 2014;7:383-92. Adib-Samii P, Brice G, Martin RJ, Markus HS. Clinical spectrum of CADASIL and the effect of cardiovascular risk factors on phenotype: Study in 200 consecutively recruited individuals. Stroke 2010;41:630-4. Razvi SS, Bone I. Single gene disorders causing ischaemic stroke. J Neurol 2006;253:685-700. Fukutake T. Cerebral autosomal recessive arteriopathy with subcortical infarcts and leukoencephalopathy (CARASIL): From discovery to gene identification. J Stroke Cerebrovasc Dis 2011;20:85-93. Hankey GJ. Potential new risk factors for ischemic stroke: What is their potential. Stroke 2006;37:2181-8. Varona JF, Bermejo F, Guerra JM, Molina JA. Long-term prognosis of ischemic stroke in young adults. Study of 272 cases. J Neurol 2004;251:1507-14. Toni D, Ahmed N, Anzini A, Lorenzano S, Brozman M, Kaste M, et al. Intravenous thrombolysis in young stroke patients: Results from the SITS-ISTR. Neurology 2012;78:880-7.